Today we put our dear old Cocker Spaniel Frannie to sleep. She had had lymphosarcoma for some time now, as well as a number of other cancers, and though she had survived it better and longer than we ever could have anticipated, we did not want her to die in a painful manner, so we made this decision. Kristina rescued Frannie from a puppy mill at the age of three, after bearing over 30 puppies. She was a true example of Kristina's gift with dogs; for the first six weeks, she was so scared and afraid of people that she wouldn't come out from underneath Kristina's bed. Her temperament was so skittish that the rescue organization just told Kristina to put her down. Kristina never got around to it, and with a lot of skill and love, Frannie became one of the sweetest dogs you could know, and she even managed to get her CD title after Kristina made the mistake of telling her students that any dog could be trained to a CD. She lived in our house for more than eleven years and became Zowie's constant companion. She raised a Poodle, two Belgian Tervuren and a Chinese Crested puppy with love, affection and only an occasional cross bark. She loved people, a good belly scratch, a nice roll in the bed, and had the affinity for a meal only Cockers have. 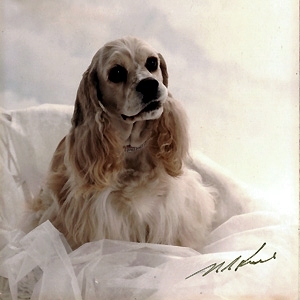 Truly, the reason the word ‘merry’ appears time and again in the Cocker Spaniel breed standard is for dogs like Frannie. Today, she waits at the Rainbow Bridge, once more keeping Zowie company, waiting for Kristina and I to arrive. Frannie, you're a good girl. We love you. The registered name you see above for Frannie is her UKC name; we felt she didn't deserve to be memorialized with the name of the puppy mill that bred her.